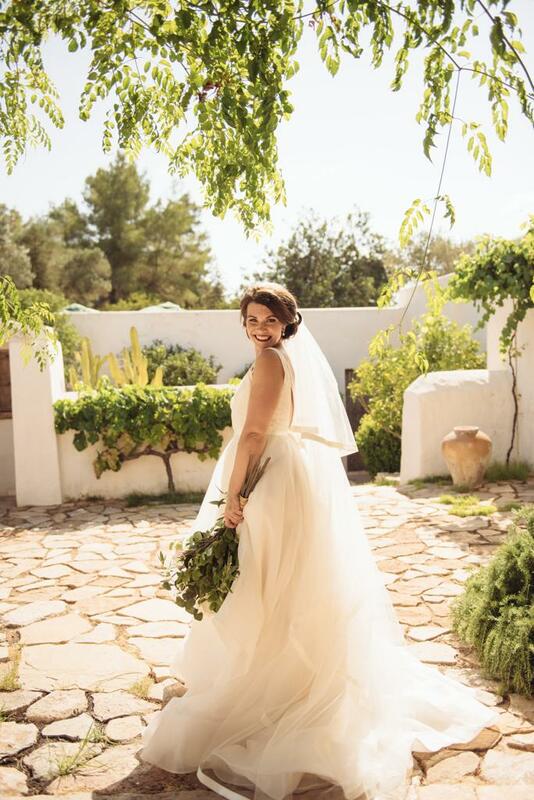 Sally and Adam married last August in a countryside villa in Ibiza, with a ceremony which will stay in my memory forever. It was relaxed, beautiful, emotional and had such an intimate feel to it, despite them having so many of their family and friends there to share those special moments with them. 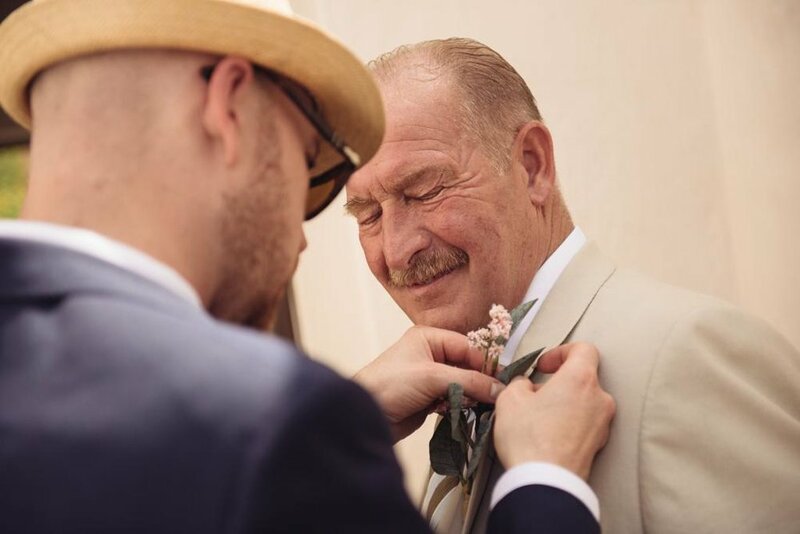 Oh and get ready to be impressed - Adam, the Groom, took on the role as wedding planner, event stylist and florist for their wedding day! The day before their wedding, Adam and Sally invited me to the villa to do a run-through of the ceremony and meet everyone who would play a part. 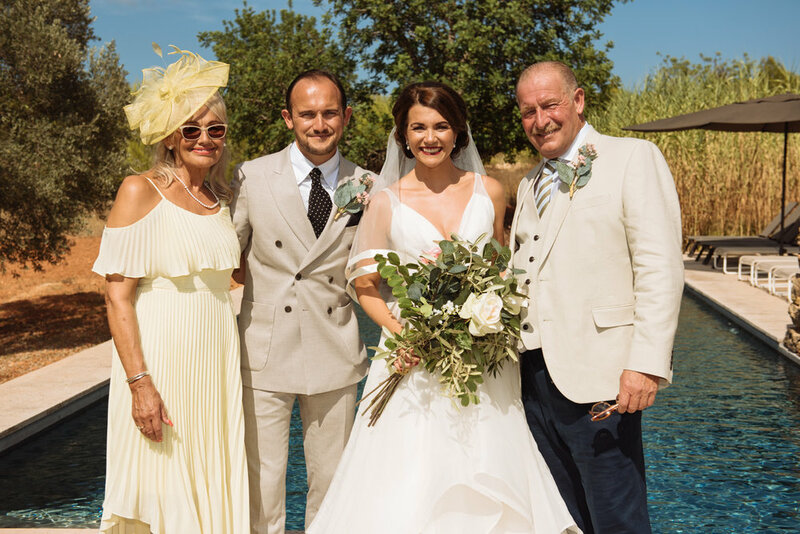 There I met the parents of both Sally and Adam, the maid of honour and bridesmaids and the best men and ushers. We all chatted and had a tour of the villa and gardens - which were STUNNING! - before heading down to the ceremony area to organise the fine details of the running of the ceremony. 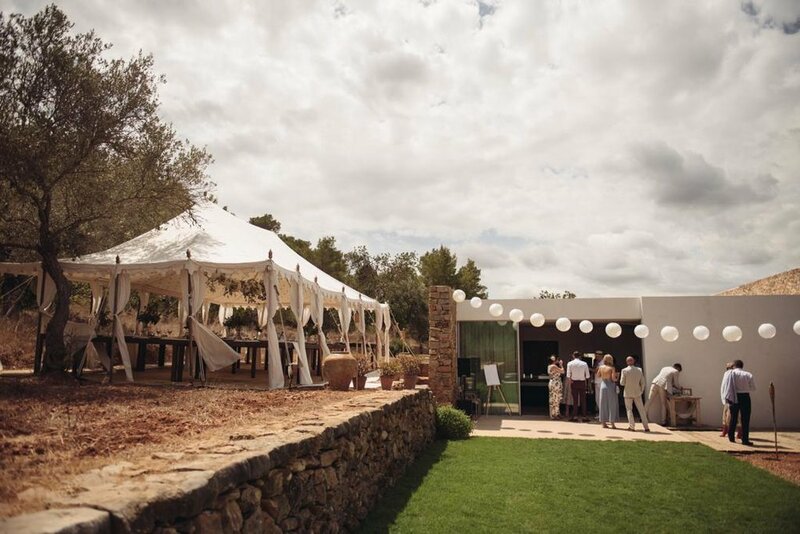 They chose a part of the land for the ceremony which was accessible via the fields which separated it from the villa and main garden/pool area, following a path alongside a traditional Ibizan stone wall. 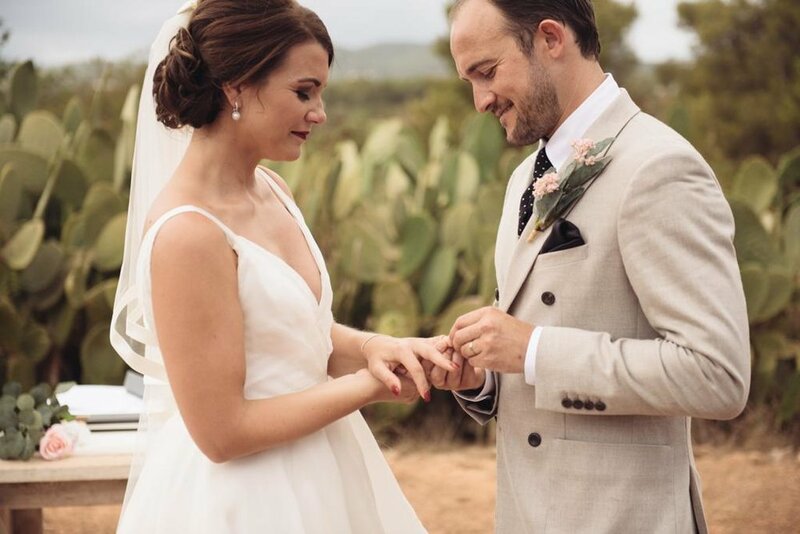 The panoramic countryside view and a huge row of cacti provided the most perfect natural ceremony backdrop I’ve ever seen. You’ll see by the end of this blog why I won’t be forgetting about it any time soon! We discussed who would sit where in the front two rows, and where the ushers would stand to direct people to their seats. Sally showed me where she would begin her entrance to the ceremony area and at what point I would start the music, and we even found a long white carpet which we decided to use as her aisle runner. Organising these fine details is the key to being able to relax on the day. That, and knowing that if things don’t go perfectly to plan, who will know? Will people care? Answer: Of course they won’t! By the time we’d finished the rehearsal and chatting to everyone I felt like one of their family or friends, they were so warm, welcoming and laid back, which made the wedding day even more special. S&A booked the Classic Ceremony Package, customised with their music choices, readings by Adam’s Mum and Sally’s brother, and their personal vows which they wrote to each other and heard for the first time during the ceremony. 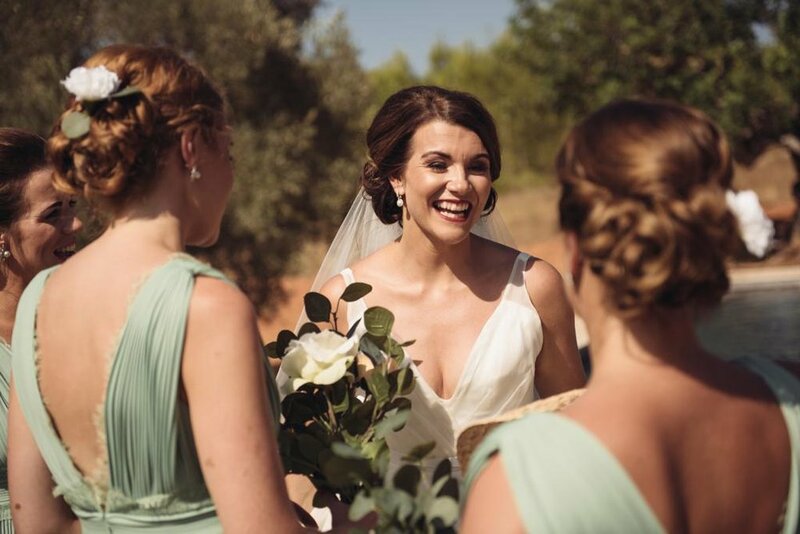 The energy that both S&A and their guests brought to the ceremony made it feel so magical and intense, with every part of the ceremony feeling so personal to them. As the bridal party arrived at the top of the hill leading down to the ceremony, I began their entrance music, Al Green - Let’s Stay Together. 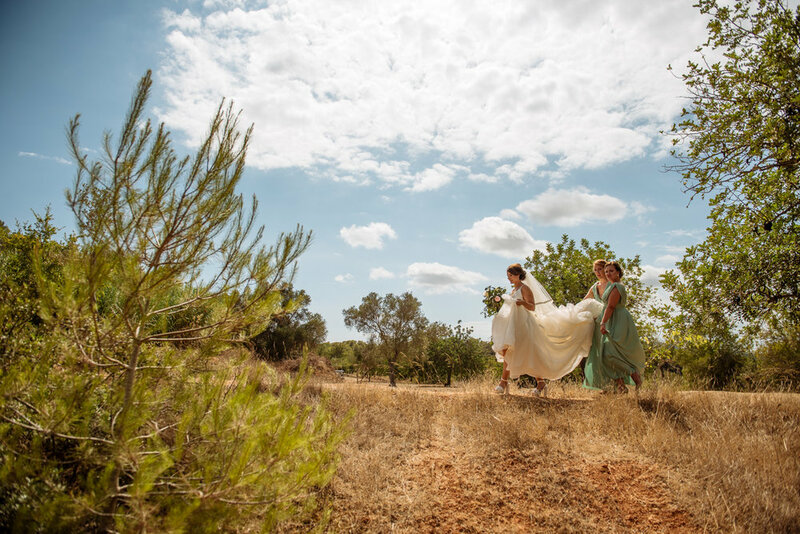 Sally’s Mum began the procession down the aisle, followed by her 4 bridesmaids, and Sally entered accompanied by her Father. After the ceremony introduction, Sally’s brother began the ceremony began with a beautiful and realistic reading about marriage. just eternal love and commitment. or shelter you from the world. and makes you feel vulnerable. And just before the couple exchanged their wedding vows to each other, Adam’s Mum Shirley came up to read. It is remembering to say, “I love you” at least once a day. It is not only marrying the right person — it is being the right partner. The most important part of a wedding ceremony is the vows, because they hold the reasoning and promises of why each couple is getting married and what they will bring to their life together. Sally, thank you for being by my side during the simplest and more challenging sides to everyday life. I promise to be there for you throughout our marriage every step of the way. To care for you in times of need. Not only a husband but your best friend, and someone you can count upon throughout the good times and the bad. I love your drive and enthusiasm to strive forward in life and I look forward to being witness of your success. You are my heart, my home, my joy, my every waking moment, my dream of happiness. Adam as I stand here before you today we all know how long I’ve waited for this moment and I now realise good things do come to those who wait! From the moment we first met you have always managed to make me laugh, I love the way you take off people in the street and always have an elaborate story to tell! You really are my best friend and the person I want to spend the rest of my life with. I love the way you are so ambitious and determined to succeed in life, when I have a problem I know you will always be by my side to fix it. Our beautiful home you have made for Olive and I, and all the cleaning you do. Adam I knew from the first holiday in Ibiza you were the ‘one’ and now I’m standing here before you ready to start the next chapter in our lives. I promise to keep our love alive through good times and bad. From this day on we stand together as a team and I will love you till death do us part. S&A exchanged rings, and I announced them for the first time as husband and wife! The catering team handed out glasses of cava to Sally and Adam and all of their guests during the signing of the certificate, as we listened to Clair de Lune - Claude Debussy. Then they made their exit down the aisle together as newlyweds to Jools Holland - I’m In The Mood For Love, and showered with white rose petals by their loved ones! After the ceremony everyone made their way back up to the main villa for photos and celebrating. 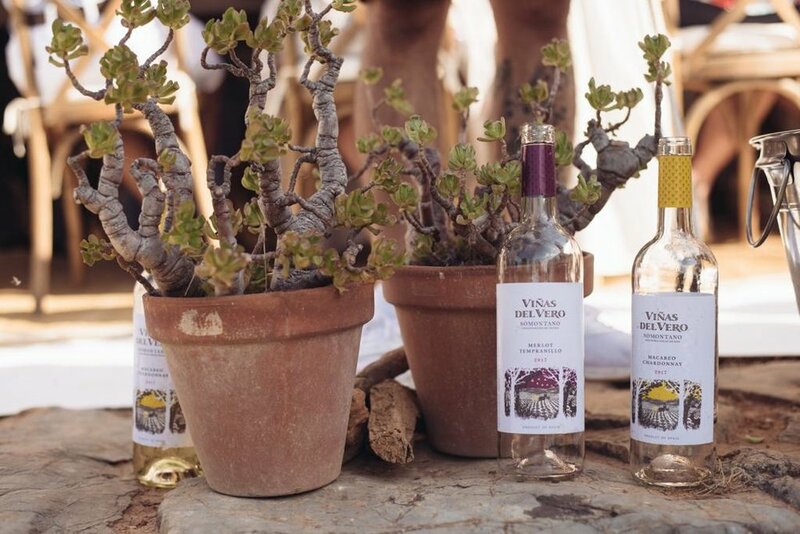 Ibiza DJ Brian Beezwax took to the decks and the bar on the garden terrace began serving. Before getting comfortable inside the incredible events tent for dinner and speeches.